Ridge Meadows Recycling has been working with the City of Maple Ridge since its beginnings in 1972. In addition to collecting curbside recycling from residents, we also collect and process different materials at the Maple Ridge Recycling Depot. This enables us to keep jobs in the community and maintain control over processing costs, the cleanliness of our product, and, to some extent, the end markets of our recyclable materials. The local market for recycled materials fluctuates constantly in response to supply & demand. Within the last number of years, North American paper mills have shut down as overseas markets, taking advantage of returning empty shipping containers and low-cost labour, offer higher prices for our commodities and become steep competition to local manufacturers. Ridge Meadows Recycling remains committed to shipping to local markets whenever possible. From 1972 – 2014, we marketed all the recycling we collected curbside directly to markets, but in 2014, the responsibility for recycling all residential printed paper and packaging shifted to an industry-created, not-for-profit society, Recycle BC (formerly MultiMaterial BC) through the province’s latest EPR stewardship program. 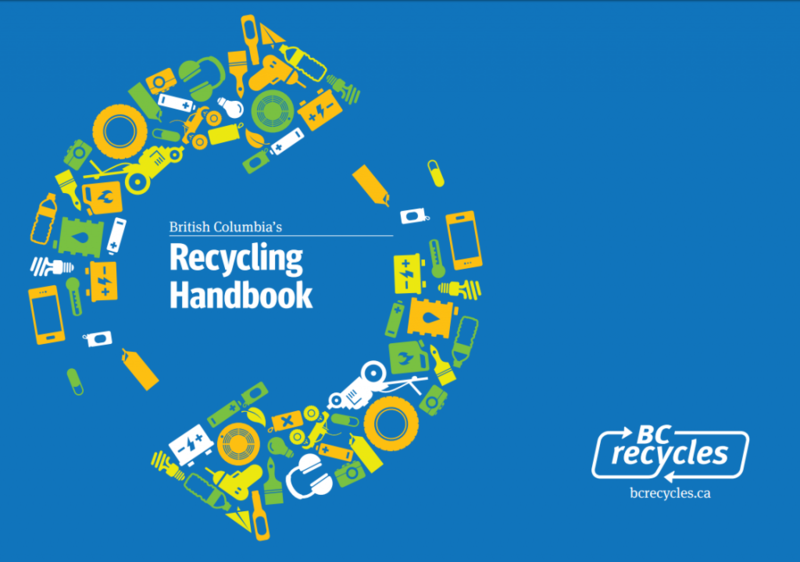 Following the provincial government’s mandate, Recycle BC now funds the collection, processing, and shipping of items collected curbside through Green By Nature and partner organizations such as Ridge Meadows Recycling Society. Clean and dirty scrap aluminum is collected and sold to companies making new products – recycling aluminum saves 95% of the electricity needed to produce aluminum from ore.
Refundable containers are taken to an Encorp Depot for refund, then recycled into more cans. Small appliances (coffee makers, list more, etc.) are collected and recycled as part of ElectroRecycle’s EPR program for Small Appliances and Power Tools. Large appliances are checked for Freon and sold as scrap metal for recycling. Refundable containers are collected taken to Encorp Pacific through their beverage container EPR program. Household, rechargeable, small appliance, & button batteries are collected as part of an EPR program by Call 2 Recycle. These are picked up by Terrapure Environmental and processed by Teck Cominco in Trail where the metals are separated and the chemicals are reused. Car, motorcycle, and other lead-acid batteries from vehicles are collected at the Maple Ridge Recycling Depot and sold to Interstate Batteries who ships them to the Teck Cominco smelter in Trail. The lead and plastic (polypropylene) are extracted to make new batteries and other materials and the acid is processed for re-use in detergents or is neutralized and treated. Corrugated cardboard is part of Recycle BC‘s Printed Paper & Packaging program. Cardboard is often recycled into “Kraft Paper” (brown paper bags), roofing paper, new cardboard boxes, and paper board. Cell phones & accessories (chargers, ear buds, cords, etc.) are collected as part of an EPR program by Recycle My Cell. These are processed by Teck Cominco in Trail where the metals are separated and the chemicals are reused. All TVs, computers and computer attachments, and other electronic or electrical equipment are accepted for recycling by Encorp Pacific as part of EPRA‘s Electronics EPR program – no resale permitted. Most are shipped to the Teck Cominco smelter in Trail for separation & processing. A ll beverage containers have a deposit and are collected as part of the Beverage Container EPR program and returned to Encorp Pacific for refunds. Other glass jars & bottles are part of Recycle BC‘s Printed Paper & Packaging program. In the past, we shipped our mixed glass to Envirogrit in Abbotsford to be made into fibreglass and contaminated glass was used as a gravel substitute. Product Care runs a Hazardous Household Waste EPR program designed to reduce the amount of hazardous waste being dumped into the sewer system. After collection, solvents, pesticides & flammables are shipped in tubskids to Paint Plus in Surrey, where they are sorted & batched for safe incineration. As part Product Care‘s “Light Recycle” EPR program, all light bulbs, including flourescent, halogen, incandescent, and LED, as well as lamps, light fixtures, chandeliers, and flashlights can be recycled. Lights from businesses are also accepted! Flourescent light bulbs & tubes are collected and shipped to Ontario for processing where a water bath is used to recover the gas and the glass is recycled. All scrap metal, including large appliances, are stripped of non-ferrous metals, including aluminum, copper, brass, copper wire, breakage, motors and compressors. Tin & aluminum cans are part of Recycle BC’s Printed Paper & Packaging program. Often, light steel is melted and formed into rebar or flat bar. These are all collected at the depot through BCOUMA‘s Used Motor Oil EPR program and sold to Terrapure Environmental, who recycle and market all elements of these products. All paper (office paper, newspaper, magazines, catalogues, etc.) is collected as part of Recycle BC’s Printed Paper & Packaging program. It is used to produce higher grades of office or tissue paper. In the past, we shipped newsprint to CK Fibre in Langley, where it was made into egg cartons and drink trays for Tim Hortons restaurants. The paper is de-inked and sold to markets across North America, mostly California where there is a legislated requirement for newspaper to have 40% post-consumer waste content. Paint is collected as part of Product Care‘s Paint, Pesticides, and Flammable Liquid, EPR program. Any community groups interested in picking up used paint for projects, call us at 604-463-5545. Plastics are collected as part of Recycle BC‘s Printed Paper & Packaging program. Merlin Plastics on Annacis Island either shreds it or melts the plastic down into pellets to be sold & used for the manufacture of non-food bearing products (bags, bottles, blue boxes, piping, etc.). Plastic beverage bottles are shipped to Encorp for refunds through their Beverage Container EPR program. Used & expired smoke, carbon monoxide, and combination alarms are collected under the AlarmRecycle program. 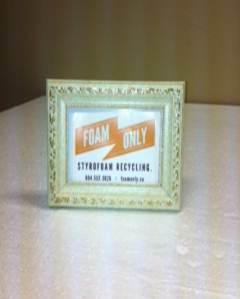 Styrofoam is collected as part of Recycle BC‘s Printed Paper & Packaging program. It is shipped to Foam Only, located in Coquitlam. This company condenses the styrofoam for shipping and makes it into finished products such as crown molding or baseboards for home decor, and picture frames. Thermostats and other mercury switches are collected as part of the “Switch the ‘Stat” EPR program designed to safely collect and process the mercury contained within them.